Washington Laboratories has been providing Electromagnetic Compatibility (EMC) Testing and Radio Frequency (RF) Testing for over thirty years. Our EMC Test Lab facilities include a 3 meter fully anechoic chamber and two 3/10 meter open area, all weather test sites as well as several indoor sites. is a The Federal Communications Commission’s limits on radio frequency emissions under FCC Part 15, in force since 1983, are an important factor in product design and development in the U.S. Our test site conforms to ANSI C63.4-2003 and is listed by the FCC’s Equipment Authorizations Branch in Columbia, Maryland. We’re able to test small handhelds up to fully configured rack systems and larger equipment. Our 9,000 square foot facility is conveniently located near Washington, D.C. 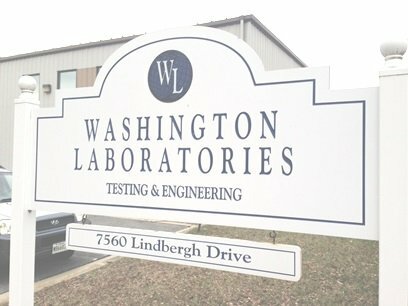 The Washington Laboratories team has extensive experience in a variety of engineering and testing programs for diverse products and systems. From compliance testing to design reviews, mitigation, site surveys, specialized test services, customized seminars and webinars and engineering expertise, we provide state-of-the-art facilities, superior engineering and testing services and knowledgeable staff to help get your company’s products to market faster. View more about our Facilities and Capabilities, Engineering Services, Safety Approvals, Field Testing, and Site Surveys. EMC testing is a focus on two two kinds of issues – emissions and susceptibilty (also known as immunity). Emissions testing is related to the generation of unwanted electromagnetic interference (EMI) by equipment operation, and to the steps necessary to reduce or avoid the unwanted emissions from escaping into the environment. Immuniy testing focuses on the correct operation of electrical equipment while withstanding unplanned or potential electromagnetic interference. Electromagnetic Compatibility (EMC) covers a broad discipline and touches the operation of equipment that greatly affects our modern lives. In essence, the “goal of EMC” is the result of all electrical and electronics equipment operating in its environment properly and without a negative effect on the environment. Early work in “RFI” or Radio Frequency Interference started in the 1930s, primarily with military systems and notably airplanes. The installation of radio equipment in early aircraft gave rise to noise problems in the radio receivers from ignition sources (spark plug noise) and related pulse and broadband interference sources, such as precipitation static (so-called “P-Static”). Other concerns, which continue today, include protection against lightning-induced energy which can threaten airborne, ground and sea-based equipment. Over the years, RFI broaden to include such issues as immunity (susceptibility) to noise, such as lightning and pulsed threats. The Military issued a number of standards for EMC performance. “The military first established EMI emission requirements for equipment in 1945 with JAN-I-225 that mandated measurement of conducted and radiated EMR in the frequency range 0.15–20 MHz. The first susceptibility requirement was introduced in 1950 in MIL-I-6181.” (Pierce). In 1967, the first versions of the MIL-STD-46X standards were issued (MIL-STD-461, MIL-STD-462 and MIL-STD-463). Eventually the -462 and -463 were merged into the same document with the “D” version of MIL-STD-461. This codified both the limits for measurements and the methods of measurement. The development of standards to protect the spectrum was boosted in the early 1980s with the advent of home-based computing equipment and related electronics (such as video games, electronic controllers, appliances, etc.). The FCC’s first Rules that directly impacted digital electronics were issued in 1984 and are enshrined in Part 15 which was carved out in the early days of the FCC to cover ‘unlicensed operation.’ When the Rule-writers crafted the regulations after ‘The Telecommunications Act of 1934,’ most users of the spectrum were broadcasters (and amateurs). The broadcasters were set aside as “protected” users of the spectrum because they had, in principal, paid for the rights to use the spectrum in their allocated space. The distribution of the spectrum in the early days is an interesting story in itself, with loads of political and influence peddling as eager market-makers battled for this precious resource. In any event, the FCC issued rules for digital devices that protected the licensed users. These regulations now affect the operation of billions of electronic devices, but only in terms of emissions from electronics devices. Immunity (with the exception of some regulated medical products) is largely left ‘to the market to decide,’ that is, if a device doesn’t work properly in its electromagnetic environment, it will be rejected as faulty. Internationally, the European Union (EU) enacted broad sets of Directives as it tried to align its customs and trade regulations to create the ‘single market’ for goods and services. The EMC Directive was enacted in 1989 (89/336/EEC) and is one of the broadest directives that affect electronics. With an eye towards creating a baseline of quality in goods and services, a certain efficacy is demanded of products. The EMC Directive mandates that products that bear the CE Marking meet the “essential requirements” which include protection of the spectrum and proper operation in the intended environment. This was a ground-breaking regulation, really, as it created a global standard (essentially) for equipment performance. The EMC Directive has been updated over the years. The current Directive, EMC Directive 2014/30/EU of the European Parliament and of the Council of 26 February 2014 on the harmonisation of the laws of the Member States relating to electromagnetic compatibility (recast) is applicable from 20 April 2016. Other areas that are included under “EMC” include all manner of electromagnetic measurements. As EM phenomena extends from DC to nearly light (the upper end of the “radio frequency spectrum, at least according to standards writers, approaches 3000 GHz, above which optical models are more aptly applied for predicting and measuring EM phenomena). Thus, magnetic fields, static phenomena, transient behavior, all are grouped under the practice of EMC. Standards and practice do not only apply to equipment and measurements of conducted emissions, radiated emissions, conducted immunity and radiated immunity; the protection of human and animals is also part of the practice of EMC. Radiation hazards measurements, from large radiating structures such as antenna arrays all the way to mobile devices, are assessed against US and International standards. In the US, ANSI C95.1 is the guiding general limit, which closely aligns with requirements in the FCC Rules under 47 CFR 1.1307(b), 1.1310, 2.1091 and 2.1093. 1. Electromagnetic Compatibility (EMC) Requirements for Military and Commercial Equipment. James D. Pierce Jr. September 2009. Reduce interference potential by knowing your electromagnetic environment. Radio frequency measurements of potential interference at your installation can help reduce problems in sensitive installations (i.e., medical devices, pacemakers, etc.) To make these determinations, very specific measurements must be taken on location. And you probably needed it done yesterday. On-site testing sometimes referred to in situ testing is an option that is often used when performing equipment evaluation at a customer location, factory or another non-laboratory test venue. There are several reasons to perform product compliance testing at a specific location, rather than at a test laboratory. A major reason is that the equipment may be physically too large for a test laboratory. The other reason is that special support equipment or infrastructure is needed to operate the equipment. For example, the electricity supply may have specific voltage or amperage requirements that cannot be accommodated in the laboratory. Other operational needs may include mechanical services such as air-handling, chemical requirements, other support equipment. Other reasons may include security issues or other special access issues relating to sensitive equipment and/or intellectual property. The testing may cover the various EMC, Safety and Machinery requirements and these are well-used methodology. Washington Laboratories provides radio frequency measurements to Personal Communications Services and Cellular providers. We are the single resource for fast, accurate and responsive RF measurements from DC to 40 GHz. There are no harmonized standards for performing on-site measurements for Electromagnetic Compatibility under the EMC Directive Directive 2004/108/EC. However, due diligence, applied to a system under test, are routinely accepted for compliance purposes. By definition, most on-site test regimens for EMC are going to reference the industrial standards and limits. A reasonable approach is to reference the generic standards IEC 61000-6-2 and 61000-6-4 for immunity and emissions, respectively. The challenge of on-site EMC testing is to manage RF ambients when making emissions measurements and to minimize adjacent equipment disruption when performing immunity testing. Test setups may be arranged as a best-practice, using reference ground planes for performing various conducted tests (conducted emissions) and ESD testing. In the United States, special conditions may apply when performing measurements for Radiated Immunity. Under the FCC Rules, a Special Temporary Authorization (STA) is usually indicated for performing RI testing outside of shielded chambers. The STA is filed electronically and the conditions are found in Part 5 of the FCC Rules. Safety evaluations are often performed on-site; field evaluations are commonplace and may be conducted at point-of-origin of equipment (manufacturer, for example) or at the point-of-installation. Safety standards can typically be adapted to on-site evaluations for compliance, however there sometimes are challenges relating to power quality and availability, as well as ambient temperature and humidity requirements. For example, some evaluations must be tested in an environmental chamber, such as a humidity “soak” prior to performing leakage or dielectric withstand testing (hipot). This may not be available at a factory, for example. Field labeling of equipment is commonplace and is often required before equipment commissioning at a particular location. Field labeling usually involves a review of the equipment installation, necessary ratings, warnings and cautions. Often, this is done prior to inspection by the electrical inspector in the jurisdiction which provides permits and approvals. Other requirements include ad-hoc procedures, such as a method developed by ANSI titled: ANSI C63.18-1997, Recommended practice for an on-site, ad hoc test method for estimating radiated electromagnetic immunity of medical devices to specific radio-frequency transmitters. New York: ANSI, 1997. This method, in particular, is used to evaluate the potential for interference at medical facilities. In a related matter, the Association for the Advancement of Medial Instrumentation (AAMI) has guidelines which has technical guidance for resolving medical device interference issues, specifically: Technical Information Report (TIR) 18, Guidance on electromagnetic compatibility of medical devices for clinical/biomedical engineers -Part 1: Radiated radio-frequency electromagnetic energy. On-site testing may be indicated by definition, that is, the Nuclear Industry often specifies site surveys that collect radiated and conducted emissions data prior to installation of equipment at nuclear power plants. The Electric Power Research Institute (EPRI) has plant emissions limits that were aggregated a number of years ago during studies of several nuclear plants. These data formed Plant Limits that are used as indicators when determining if special susceptibility conditions may need to be established for certain types of equipment. A site survey is the only way to determine if a particular plant may have strong ambient conditions. The data that are normally collected include electric field and magnetic field intensities and conducted currents on conductors associated with the equipment installation.